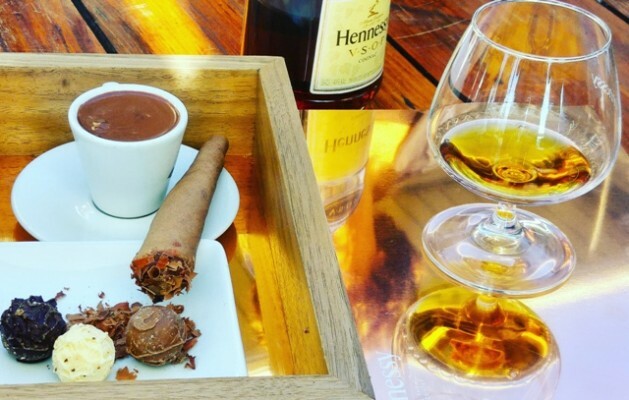 Shimmy Beach Club and Hennessy have joined forces this winter to create an exquisite after-dinner indulgence box, paired with either the Hennessy Privilège VSOP or Hennessy XO cognac. · Three chocolate truffles –decadent bite-sized truffles in white, dark and milk flavour. · A serve of Hennessy Cognac – choose from XO or VSOP. Guests can endoff a hearty winter meal at Shimmy Beach Club in an indulgent, decadent way. 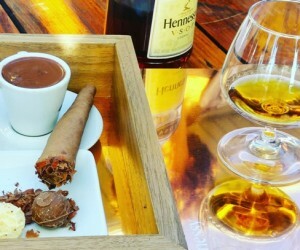 Smoky, bitter and sweet flavours with varying textures are accompanied by a beautifully smoothHennessy cognac. Order the sinfully delicious Hennessy box from your waiter at R145 (VSOP) or R265 (XO), until the end of August 2016. This best-selling cognac was created in 1870 by Maurice Hennessy, great grandson to the founder, Richard Hennessy. It is a complex blend of over 100 "eaux-de-vie" from the best 4 premier crus and aged up to 30 years -the aromas created are masculine and generous blend with notes of ripe fruit, cinnamon, clove and vanilla. This cognac was made exclusivelyfor the private use of the Hennessy family. The XO stands for “eXtraOld”, and is the only XO cognac for the last 100 years. Originally created for royalty in 1817, a VSOP (Very Superior Old Pale) was ordered by the future King Georges IV of Britain. Nowadays the cognac consists of a complex and delicate blendof around 60 "eaux-de-vie" from the 4 cognac premiers crus. The V.S.O.P is aged up to 15 years in seasoned French oak casks to create a velvety, complex blend of delicate spice & honeyed fruit flavours. To reserve a table in the restaurant email info@shimmybeachclub.co.za, call 021 200 7778 or book online via the website or app, www.shimmybeachclub.com. To view the new menu, Visit Shimmy Beach Club’s website http://www.Shimmybeachclub.com/ or the App.